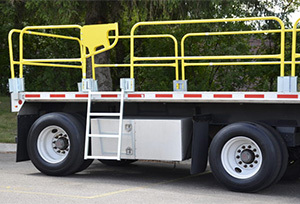 Meeting OSHA 1910.23(c) requirements, this guard rail system quickly installs around the full perimeter of a 53' flatbed trailer, allowing workers to load or unload cargo more safely since open edges are guarded against fall risks. 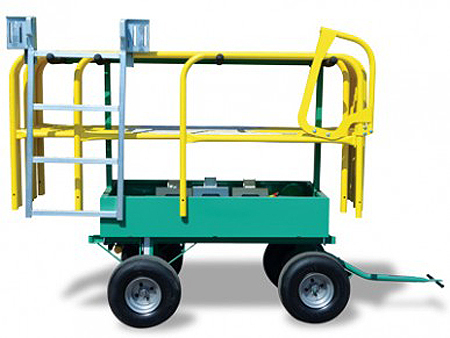 This safe work zone system sets up in less than 15 minutes by dropping in stake pockets and includes rough-terrain storage cart, vertical ladder, safety rails, ladder gate and drop-in pockets. All components store on the stairway platform. A clamp-on system is available for trailers with missing or damaged stake pockets. Contact us for more information. This system is for flatbed trailers with stake pockets in good condition. In order for the system's rail pockets to be installed, stake pockets must be able to accept a full 2"x4" object. If trailer stake pockets are not in good condition, order clamp system instead. Plastic Sleeved Steel Handrail - Starter, 42"H x 5'L x 1.9"Dia.